With over 35 years of experience as a kitchen and bath designer, Caroline brings a wealth of experience to every project. 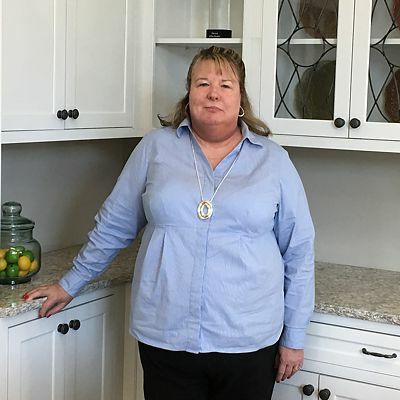 As a Certified Kitchen Design (CKD) with the National Kitchen and Bath Association (NKBA), she has previously won an honorable mention for kitchen design in their national design competition. With a BS in Home Economics and Interior Design from Hood College in Frederick, Maryland, Caroline has always enjoyed the space planning part of design. She started working after college in the Housatonic Valley. For the last 12 years Caroline has worked on homes along the Connecticut shoreline from Norwalk to Madison. Caroline joined our Kitchen Views design team in March 2017. Caroline grew up in Shelton, where she attended Shelton High School. She has lived in Oxford with her husband since 1985. Their three children grew up here. They live in a home that was built in 1800. She and her husband have done all the renovation work themselves, so she knows first-hand about the challenges and rewards of renovating a home. Always enjoying a challenge, Caroline and her husband are rebuilding a cottage in Massachusetts that they call their “tiny home”, as it is only 300 square feet of living space – 400 square feet if you count the porch!